Select Planned Maintenance in the product drop down menu. The Application Links drop down box is used if you are a user in multiple Dude Solutions applications, you can select the application from the list to jump between the different programs. The Help link gives you all the available help options needed to answer your Planned Maintenance questions. Home - takes you to the Planned Maintenance home page. Calendar - takes you to the Calendar page where you can view past and upcoming PM work that is currently scheduled by Location, Classification, Type, Craft, or Assigned To. New Schedule - where you can enter a new PM schedule. 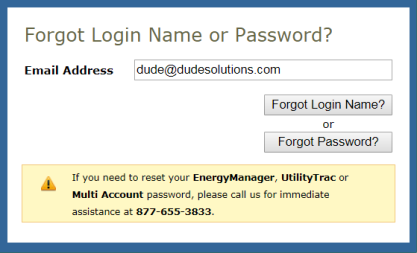 Account Setup - where you can set up certain aspects of your Planned Maintenance account. The Search For box under the Home tab can be used to find a specific PM schedule. Enter a keyword to bring up a list of PM schedules associated with that term. The Advanced Search link takes you to a more advanced search form where you can select multiple criteria to find the schedule you are looking for. 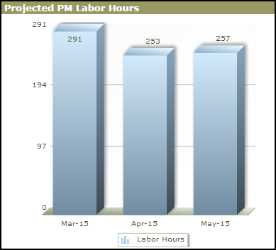 The center section of your Planned Maintenance home page graphs the amount of PM labor hours projected for the next three months. The hours are calculated by adding the Estimated Hours entered in Step 15 of any PM schedule that is scheduled for that month. The graph is helpful when adding new PM schedules to see which months allow for more time to be spent on PM work than others. The Information Analysis section on the right side of the home page gives you links to all the major components of Planned Maintenance. You can click on a link to view, add, and report on that specific information. 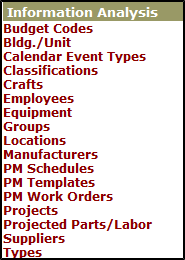 Access lists of your PM Schedules, PM Templates, and PM Work Orders by clicking on the corresponding link. Schedules listed under the In Definition section are schedules that have been started but not completed. These schedules are not yet active and will not generate work orders. If you start a PM schedule and do not get a chance to finish it, it will be listed here. You can edit the schedule by clicking on the title and completing the unfinished steps, or delete the schedule by clicking on the red x. This section displays shortcut links to different functions of the system. 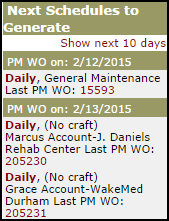 Create PM Schedule - Shortcut link to enter a new Planned Maintenance Schedule. Print PM Work Orders - Shortcut link to the Batch Print feature for PM work orders. This section at the bottom of the left side of the home page lists upcoming work orders that will be generated from your PM Schedules. You can click on the frequency link in red to access the schedule that will generate the next work order, or click on the last WOID number that was last generated from that schedule to access the work order details.